Kamehameha-Hawaii's QB Nick Miyasato was overcome by Kaimuki defenders last night. The concept was simple: control field position, control the game. Kaimuki put on a dominant effort defensively, limiting Kamehameha-Hawaii to 21 yards of total offense and poor field position throughout to knock out the Warriors 22-0 in the opening round of the First Hawaiian Bank Division II Football State Championships last night at Kaiser High School. Chezz Ramos-Dias caught two passes from Kapono Kaiwi-Barrionuebo for two touchdowns and Justin Paderes -- the Oahu Interscholastic Association White Division leading rusher with more than 1,300 yards this season -- racked up 111 yards on the ground. And this despite taking several brutal hits from lineman Kyle Lonokapu and missing part of the game with a tweaked right ankle. 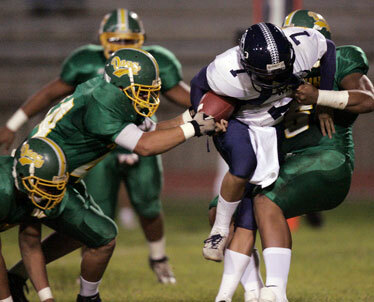 "It was a good, physical game," Kaimuki coach Darren Johnson said. "Kamehameha, they're a good football team. But our defense has been doing it for us all year. They gave us the ball in good field position. I can't say enough good things about (the unit)." The OIA White champion and fourth-seeded Bulldogs (11-1) advanced to play top seed Lahainaluna in a semifinal at Maui's War Memorial Stadium this Saturday. The Maui Interscholastic League owns the current Division II title, thanks to King Kekaulike's triumph last year. Kamehameha-Hawaii (8-5), the Big Island Interscholastic Federation champion, wrote a new chapter in its well-chronicled struggles against OIA foes in opening rounds of state tournaments. It was the third straight season an OIA team sent the Warriors packing, after losses to Moanalua and Waipahu to start the tournament in each of the last two years. On their first three drives, the Warriors got absolutely nothing going offensively. Running back Kolten Wong was repeatedly swallowed up in the backfield by Kaimuki's massive defensive line and limited to 15 yards rushing. It forced the Warriors to start going to the pass with a five-receiver alignment, taking them out of their element. That didn't work well initially, as quarterback Nick Miyasato started 0-for-5, and his first completion went for a negative yard. "They got some good talent on that defense," KS-Hawaii coach Ulima Afoa said. "One of our weaknesses was a young offensive line. But one thing we can take away, we got some building blocks on our defense." Kamehameha-Hawaii's offense managed 16 yards on its first three drives, and by halftime the Warriors had 24 yards in total offense. Their only foray into Kaimuki territory in the first half was undone by a drive-killing intentional-grounding call on Miyasato. And when the Warriors lined up for a 32-yard field goal with 4 minutes left in the third quarter, the Bulldogs bowled through Kamehameha's protective front to block the kick. Kaimuki enjoyed favorable position throughout the first half, due in part to the Warriors' offensive struggles, and Bulldog punter Tevita Aholelei's booming kicks. They pinned Kamehameha-Hawaii at its 1- and 10-yard lines on consecutive drives. The second punt paid dividends when a bad snap got away from Miyasato and rolled into the end zone. Miyasato fell on the ball, but the Kaimuki defense was fast on his trail and forced a safety to go up 9-0. Paderes, a junior, went out with his hurt ankle midway through the second quarter, but Kaiwi-Barrionuebo picked up the slack with an 8-yard touchdown strike to Ramos-Dias to make it 16-0 at the break. "I told them, 'Hey guys, let's do this for Justin,' " Kaiwi-Barrionuebo said. "Keep your guys head in the game, because they were all excited and stuff." "That felt good, that felt really good," Paderes said of the play. "I just gotta thank my defense -- they were big for us." RUSHING -- Kamehameha-Hawaii: Kolten Wong 10-15, Team 1-(-10), Hogan Rosehill 1-(-15), Nick Miyasato 6-(-22). Kaimuki: Justin Paderes 27-111, Joshua Gacusana 11-47, Aholelei 5-17, Kaiwi-Barrionuebo 9-5, Makalii Nahinu 1-5, Justin Perreira 1-4. PASSING -- Kamehameha-Hawaii: Miyasato 9-21-1-53. Kaimuki: Kaiwi-Barrionuebo 5-10-1-35, Nainoa Hiapo 0-1-0-0. RECEIVING -- Kamehameha-Hawaii: Kawika Cazimero 3-22, Wong 2-15, Rosehill 2-11, Issac Chung 1-7, Kana Silva 1-(2). Kaimuki: Ramos-Dias 2-25, Romnick Pagurayan 1-9, Chris Fiamate 1-5, Aholelei 1-(-4). Senior running back Kelii Ruiz ran for 171 yards and two touchdowns to lead the Red Raiders in a blow-out win over the Rough Riders. Sophomore Peleku Yasay, a recent call-up from the junior varsity, added 90 rushing yards and scored a touchdown early in the third quarter for Kauai. Roosevelt's offense struggled throughout, managing only 149 total yards. Kauai advances to play Iolani in the Division II state semifinals. RUSHING -- Kauai: Ruiz 24-171, Yasay 9-90, Allianic 6-53, Donovan Refamonte 5-22, Renaud 2-(-12). Roosevelt: Tuitama 13-78, Justy Kalilimoku 1-1, Lowen Kahooilihala 6-(-7), Fujii 3-(-12), Fowler, 3-(-13), . PASSING -- Kauai: Allianic 6-10-0-52, Renaud 1-3-1-20. Roosevelt: Fujii 7-14-2-48, Kahooilihala 4-8-0-27, Tuitama 1-2-1-27. RECEIVING -- Kauai: Ceria-Lux 2-20, John Gebauer 1-19, Ruiz 1-13, Renaud 1-12, Joshua Kahananui 1-7, Dayne Murata 1-1. Roosevelt: Tuitama 4-30, Fowler 3-23, Keenan Koizumi 2-40, Justin Otaguro 2-6, Furata-Harada 1-3.